Do you ever wonder how organized people keep their homes in order? I always love reading about the daily routines and habits of others and shared several of my own in Love The Home You Have. 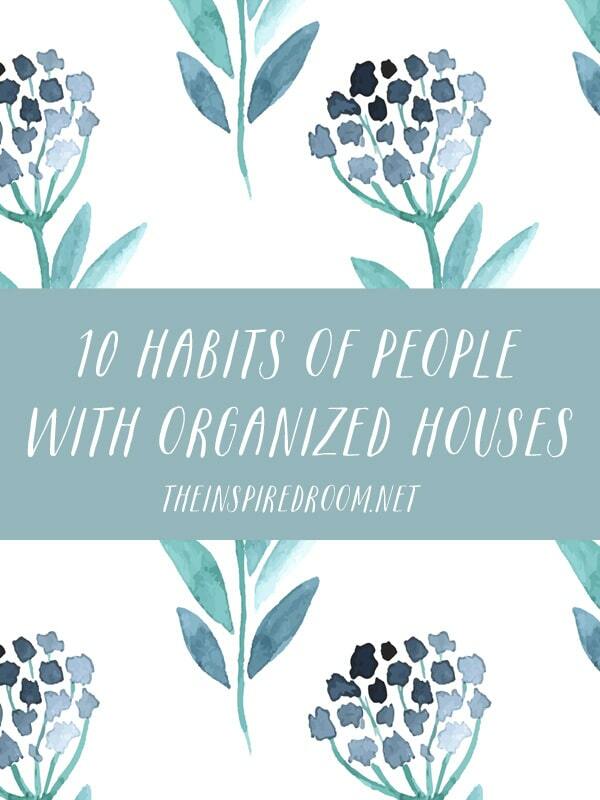 Lately I’ve been doing some thinking about what habits are helpful or necessary, particularly in home organization. Here’s what I came up with! What are some other organizational habits you think are important? Which ones do you struggle with the most? They recognize that being organized is a key to their success and happiness. Rather than viewing organization as a chore that keeps them too busy to enjoy life, they understand that organization contributes positively to their well-being. They feel less stress because they can find what they want, clean up is a breeze, they are more prepared for their day to achieve and accomplish their goals. They know that organization helps them to be set up to be financially successful. Organization and order in their life allows them to be more spontaneous and giving when they see a need. This is a big one! They are not emotionally attached or hindered by stuff. When considering a purchase, they think about more than just the cost or the benefit of ownership. They also consider how that purchase could affect or negatively impact their space or life. They assess what the new item will cost them in time, upkeep, or additional clutter. They often have a system where they give away one thing for every new thing they bring in to their home so they can maintain the balance and order of their home. Organized people are determined to avoid the pile up of clutter. They take care of messes and disorder before they grow into big projects. They put their clothes directly into the hamper. Not on the bed, not on the floor, not in the bathroom…straight to the hamper! They have a place for everything and make it a habit to put things away right away. If it will only take a few minutes to do, they complete the task right away rather than saving it for later. They set the tone for each day by being productive right away. Simple daily tasks such as making the bed and tidying up the bathroom (before they begin their daily work) helps them to set the tone for the day and inspires them to continue to be orderly, systematic and efficient. They might have a long to-do list, but they are always careful to prioritize. They create daily task lists to keep themselves focused on their goals for each day in priority order, and they focus on completing each task one by one until it’s done. 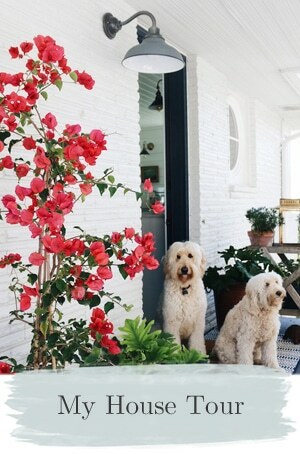 They use a large notepad or a daily calendar so they don’t waste time searching for paper scraps or writing little notes in multiple locations. They are careful not to say ‘yes’ to everything that comes their way and they feel free to say no when something will negatively impact their schedule or order of their home. They are also able to easily prioritize more time for the people and fun in their life due to the efficiency with how they complete household tasks and daily work assignments. Organized people do not necessarily have every shelf labeled, every closet color-coded, or every drawer ready to be photographed for a magazine. Organized people know how to utilize systems that work well for them. The minute a system becomes too complicated to maintain, they find a solution that makes it more effortless and foolproof. They understand that complicated systems are just that, too complicated to maintain or remember. They have a place for everything so they can find what they need in five minutes or less. Organized people are delegators. They are effective at creating opportunities for others. They make it a priority to divide responsibility and are organized enough themselves to keep people on task and hold others accountable. Rather than offering excuses for why they are disorganized, organized people find solutions. Organized people have an aversion to cluttered surfaces. They pick things up off the floor every day and clear counters regularly. They aren’t necessarily minimalists, they simply resolve to maintain order so when clutter appears, it is recognized as something that doesn’t belong and can instantly be taken care of. They have a shredder and a recycling bin. They set up a location in their home and in their place of business for important papers such as bills, filing, and items such as invitations or contracts or warranties they will need in the future. They don’t set papers all over the house or in piles on their desk and floor. When they bring the mail in, they immediately shred or recycle what they don’t need. They set up a simple filing system or location for bills to pay and a place to put bills (or immediately shred them) when the bill is paid. 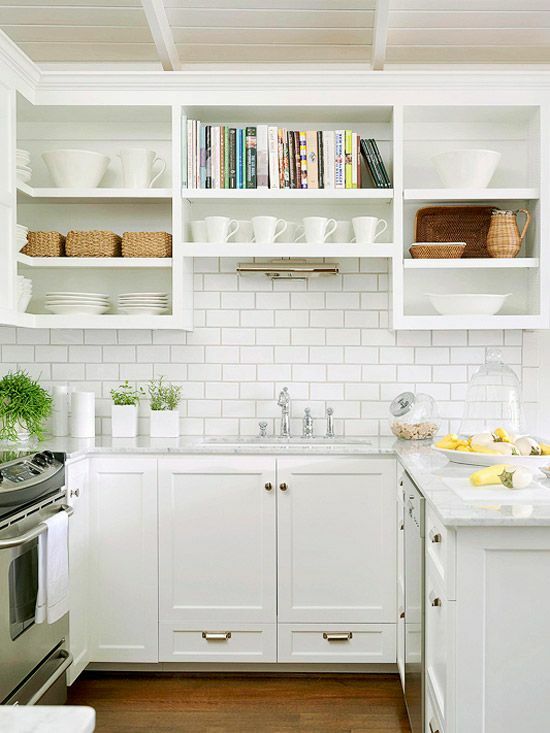 What habits could you incorporate to better the organization and efficiency of your home? Get inspired to organize and simplify your home and life! 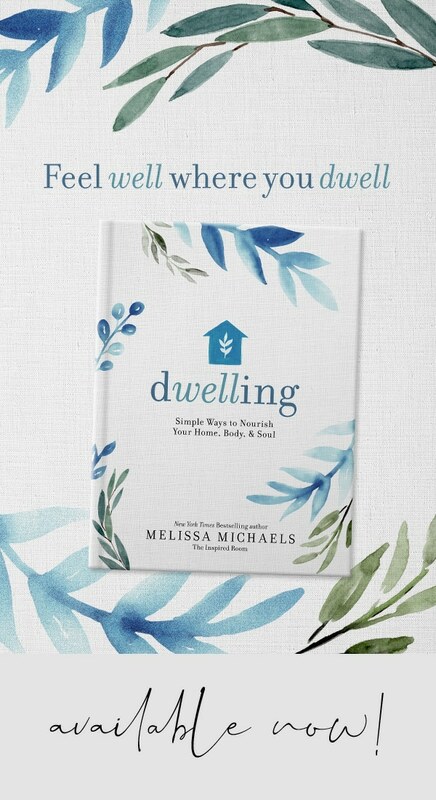 Melissa, Thank you for this inspiring post! 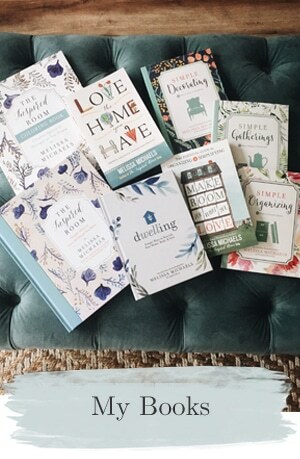 As I read it, I realized I have a couple areas in our home that need a little…ok, maybe a lot..more organization because a pile keeps building! A pile of mail and my husband’s office are on my list to tackle this week. I’m determined to come up with a system that works! Thanks again. I sort the mail right away. All the junk goes into our burnable trash bag, to be burned, and the rest gets filed. I also try to keep the piling up on our kitchen counter from happening. It takes just a few minutes a day to corral the clutter. There are areas that I could manage better than I do, but It’s so much better than it was when I was a young married! I loved your post… You describe organization in our lifes in a very realistc way! My own motto is “Managed mundane is the foundation for the sublime to grow”. I read a quote somewhere that has always helped me “You can’t organize clutter”. Thanks Melissa for this timely reminder this morning. For me, I find that managing stuff takes time and it is time that I really would much prefer being with people. I keep fine tuning the stuff part so I can get to the part I really love! I’ve always been an organized person. My spiritual gifts are organization and administration. I find that staying organized and keeping things neat and tidy makes life so much easier than having to run around and frantically get things done. I’m also a little OCD (the hubby swears that I’m more than a little) so that may be a contributing factor also. Unfortunately, I’m not good at delegating. I would rather do it myself and be finished with the task than hand it over to someone else to take care of. :-/ I’m in the process of reading your book! Loving it!! At this point, I think I may just have to find someone with those skills and marry them. I try but feel very overwhelmed! I just discovered the KonMari method/book, and it’s revolutionized my life. If you haven’t already, you should get the book! Kim, I just discovered the KonMari method as well. I echo what you said about revolutionizing my life! I just started and I have 7 bags of cclothing to discard. The idea of approaching organization by categories instead of rooms really resonates with me. We have been in our home for nearly 40 years and have way too much “stuff”. We recenntly lost my husband’s Mom and cleared out over 100 trash bags full of her belongings. I do not want to leave my own children with that kind of a burden. THANK YOU! Nice to know these characteristics are recognized and appreciated. I often, get push-back from my husband and kids who think I have some time of disorder! Haha! If only they knew how chaotic our family life would be if I weren’t so organized! Loved this article. It describes my personality and is a great reminder/motivator. I need to share this with my family so they know I am not crazy or alone in my quest for organization and a simpler way of life. Thank you for sharing! This is such a helpful and inspiring post. I can related to #6. I have done this in the past, keep it simple! This post is a reinforcement that all my efforts organizing and putting order in my home and the workplace is not in vain. I already see the light at the end of the tunnel and I feel so much more accomplished and organized. It’s the only way I have found to add time to the clock – per say. I’m far from a neat freak but I’ve grown to appreciate the process of organization as well as the benefits of an orderly uncluttered life. I have to admit I’m currently struggling with the prioritizing part of organization. I struggle with shiny object syndrome and I say yes to projects that waist that extra time I figured out for myself. Darn it! Still, I encourage others to fight through the feeling of overwhelm to tackle that bull of clutter in order to have a happy home and an even happier regard for our own uncluttered happiness. It’s so worth it! i struggle with all of these. there’s always something else that has to get done, it seems. thanks for the reminder that intentions mean nothing without actions. So THAT’S what they do! I so want to join the ranks of people with organized houses. Even though I’m not really a very organized person, this post gives me hope that I can have an organized home! :) Thanks for the tips. 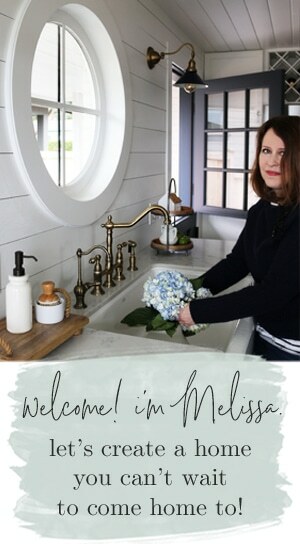 Great blog post, Melissa! In January I decided to make 2015 the year for organization and order – a place for everything and everything in its place! I can’t tell you how freeing it is! My TO DO list now includes the things I want to do, not those nagging half-finished projects that made me exhausted just thinking about them. 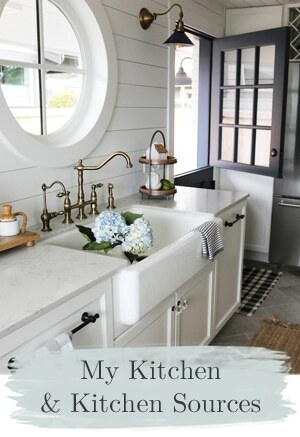 I have more time to make fabulous, creative meals for my husband, peruse a few chapters of my new favorite book ( Love the Home you Have! ), make fun things in my sewing room or even take a nap! I can’t believe I didn’t do this sooner! Love this! I am finally getting to my basement storage room-my secret Bat cave of hoarding. The rest of my house appears organized to the outsider, but I know what lurks beneath… I am shaking my head A LOT at all the stuff I have held on to for years. Mainly because it held sentimental value related to my kids. But after helping my in-laws downsize for the past year, I now see those “treasures” as a burden to the next generation. I am ready to get rid of all but the most precious items, and purge the Bat cave once and for all. Oh dear! I feel like I just read about “me”! Forwarded it to my boyfriend so he understands my habits all have a purpose…hee hee Thanks! I am resizing (I don’t like downsizing!). It is so freeing to let go of items that were hanging around ready to be transformed into another Pinterest project. I used to be a stamper/scrapbooker but I have not made one for years. I am selling all my supplies so that I can open up to another interest – and who knows what that will be but I am open to it now! Thanks for the habits list. I do many of these and it makes a difference in daily life. Such a great article! I pride myself in being one of those “organized” people, but just realized there are areas that I can improve (hello delegation). Thanks so much! So true! I always make sure to keep my home organized. If I hold it off till later, chances are I won’t get it done, haha. Such great tips! I am inspired to go organize now (organizing fanatic over here!)!!! Thanks for inspiring us to stay organized, Melissa. It makes for a happier life. I just laughed at myself reading your list.Aside from organizing the house I’m really into organizing the kitchen. This post made my day thank you. Those are really nice tips, thanks for sharing. I struggle with priorities. Everything seems important- all the time. I feel like I am trying to do everything at once. I also struggle with doing it right now because by the end of the day I am so tired I just can’t bare to pick up another piece of clothing or wash another dish. I pray for energy and endurance to keep up. Excellent insight and so true! Especially the second one, very hard to be conscience when making purchases. In January 2014 I decided to put together a housecleaing chore list. I put it on the COZI app, which I share with my husband so that he could see the list of chores. Every day has a task. For example, the floors get swept and mopped every Monday, vacuuming is on Tuesday, etc. This has allowed me to tackle one task a day before I start work. It leaves me feeling balanced and then I have more time to spend with my family. This was a good test for me, as I consider myself organized (I better be if people are paying me to help them right?) I have to wholeheartedly agree with this list. I find habits like these bring me peace and calm, so I really enjoy them. I never buy without knowing where an item is going to go the second I get home. I inspired through your post. I love your thought how we organize everything in our life in a simple way. I keep re reading these 10 rules and I believe they are sooooooo true!!! 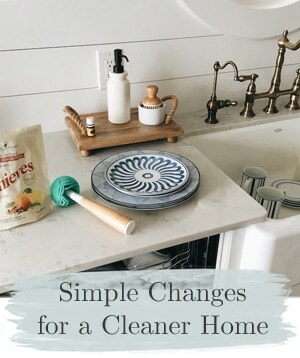 A few years ago I lived in a house that from the outside was gorgeous, from the inside it revealed itself to have terrible to clean wooden floors, too high to be cleaned ceilings and so on… It became a mess. I was overwhelmed by cahos. Then one year ago I moved to a lovely home where I lived as a teenager… It is much more small but instead of the other house it has Perfect floors..perfect spaces…I made it so well organized while restoring it (and keeping in mind the terrible Experience with the other big messy house), that now I really feel at Home there! And I encourage friends and family to be organized at home..it really gives you freedom and liberty and happiness! Thank you for all your beautiful posts and lovely reading, you are an Amazing writer! Have a nice evening and bye!!! It took me along time to get myself organized. But once I started, it reflected on every area of my life. I am never late now. For work or going out. I know where everything is – especially when I am getting dressed. I have a full & complete pantry – but am not overloaded. Everything stays in its place. Things are clean. I am proud of my home. Now – I need to take the time & tackle my office. I recommend being organized – not crazy !! I think you nailed it here…People always tell me I’m very organized and it’s true…I do all these things! You are so right. I’m sure it’s much more of a challenge with a larger family at home.